The Hellios is a highly versatile self-propelled sprayer. 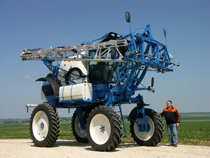 The machine features a 140 hp engine and booms between 24 to 38m width. 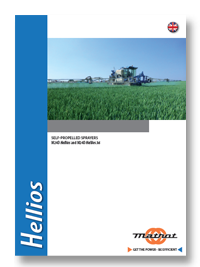 Hellios: from 24 to 32 m; model Hellios 36:b>Hellios 36: 36, 36/38 and 38 m), 2500 or 3000 l main tank)< The Hellios is the lightest sprayer in it’s category: With an unladen weight of 6,3 t only and a hydromechanic transmission on the rear axle, the Hellios allows operations at a very early stage in the season as it will easily run on wet or soft soils. New: The Hellios 36 featuring an enhanced suspension and a widened front frame has been launched in 2013. Driving comfort: The Hellios range of sprayers all come with Cabs rated to the Category 4 standard thus granting highest operational safety and healthy working conditions at all times. The cabin interior is soundproof, the tainted windshields offer a panoramic view when driving on road or in the fields. The cabin suspension offers great driving comfort during long working days. Its excellent weight/power ratio: I was looking for a light sprayer to minimize soil compaction. With its 6.3 tons, the Hellios is fully in line with my needs: it is by far the lightest sprayer of its category! Now that I work with the Hellios, my spraying operations became very time efficient thanks to the large capacity main tank, while preserving my soils at the smae time. Its handling ability: The Hellios is a highly versatile and easy to handle self-propelled sprayer. Thanks to the 140 hp engine, the little weight and the Hydromechanic transmission, and the 4 wheel driving/ steering system, the Hellios allows operations under any conditions. Electrical steering command on rear wheels. Multidisk brakes immersed into the rear axles. Gear reducers integrated in the wheel rims. Two 16 mm bolts on rear wheels. Three point pneumatic suspension. A compressor automatically inflates/ deflates the air springs according to the tank load. Independent levelling valves controlling the air springs provide great boom stability & excellent driving comfort. Pressurised cab rated to the Category 4 standard: protection against dust, aerosols and vapours, triple air filtration (particle, paper and, charcoal filters), manually controlled air-conditioning. The cabin pressurization will start as soon as the cab door is closed. New steering column featuring the pilot lights and the engine screen. Graduated rinsing hopper with 35 l capacity and separate hose with spray gun, 20 liters hand-washing tank and canister rinsing device. 500 l/min centrifugal pump for spraying, filling tank and agitation as a stabndard on the Hellios II Classic and X Lines with booms of up to 28 m width. Hypro Pump with 696 l l/Min capacity on Hellios II X-Lines with booms over 28m width. Nozzle protection on boom ends. 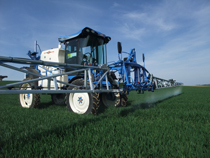 1/4 turn Nozal nozzles – three sets of Nozal nozzles at customer's choice are included with each sprayer.